"Over the summer I was saddened to hear that the future of the UK Schools Chess Challenge, the world's largest chess competition, was in doubt. The UK Schools Chess Challenge is very close to my heart. Indeed, way back in 1996 it was the first major tournament that I won. This opened some incredible doors, playing chess on Blue Peter and meeting the world champion, Garry Kasparov. I subsequently went on to win the UK Schools chess challenge eight times. 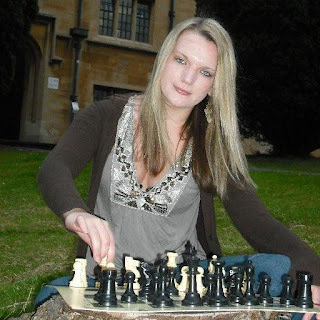 My early involvement in schools chess was certainly the catalyst to going on and winning the British Ladies title 2013 and representing the English ladies team at the world chess Olympiads. Today I am a lawyer. However, since last year I have been 'full time' on chess teaching and playing in various competitions home and abroad. I am delighted that my bid to take over the UK Schools Chess Challenge has been accepted. I am supported by my husband Alex Longson, a strong chess player and also a chartered accountant. We hope our professional backgrounds will add credence as the competition enters a new phase. I hope the UK Schools Chess Challenge continues to inspire and opens up new horizons. I also hope it continues to vaunt the belief that 'mental challenge and competition' is the 'equal of the sports field'. We met with Mike Basman and Pat Armstrong last weekend to discuss plans and they are happy to work with us to make this tournament a success." It's certainly good news that the event will be continuing, and it seems that Mike Basman will still be involved, although probably in the 'back room'.